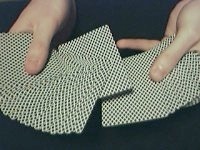 If you spread the cards with you hands under the spread you can take half of the spread in your right hand like you let a spectator pick a card from somewhere in the middle. When you flick your ring finger towards you, the card on the bottom of the spread will shoot towards you. It’s all in the flicking of the finger.